Julie Turney, a 62-year-old full-time letter carrier with the United States Postal Service from San Luis Obispo, Calif., has dedicated a good portion of her personal and professional life to finding ways to support the Muscular Dystrophy Association. Her fundraising started years ago while managing a small bar and grill right after college in the 1980s. “We sold MDA Shamrocks around St. Patrick’s Day, and I participated in an Ugly Bartender Contest. I wore a paper bag over my head and tended the bar for a whole week – all of my tips were donated to MDA,” Julie shared. “[After college] I fell in love with San Luis Obispo, fell in love with the man and I stayed here forever,” Julie says. She also made a connection with the community that helped further her commitment to MDA. Julie is celebrating her 28th year as a letter carrier and a proud member of Branch 52 of the National Association of Letter Carriers (NALC), one of MDA’s first national sponsoring organizations. Ten years ago, Julie voluntarily took on the role of fundraising manager for her branch. 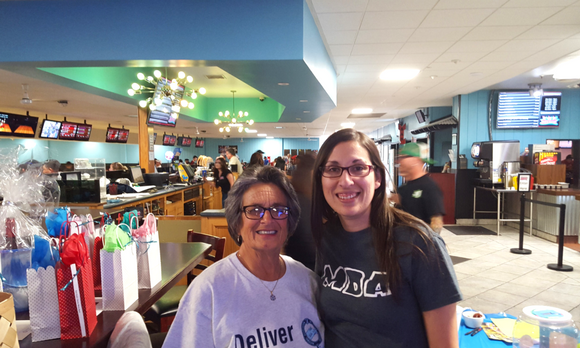 Julie assists her branch in raising money for MDA through Strike Out MD, their annual bowl-a-thon. She has also spearheaded 50/50 drawings, a fundraising picnic, See’s candy sales, fundraising dinners at their local steakhouse and letter writing campaigns for other coworkers to use and share. “I could not do this alone. Many other members and family members step up to help. It takes a lot of planning and time. Sometimes you must be creative in your fundraising – it’s easier to have a few throughout the year,” Julie says. 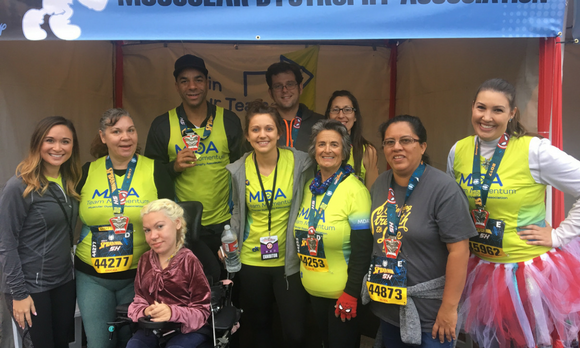 Most recently, Julie joined MDA Team Momentum – MDA’s endurance program that empowers individuals of all athletic abilities to train and dedicate miles and their fundraising dollars to help kids and adults with muscular dystrophy, ALS and related life-threatening diseases. She registered and completed the Disney Super Heroes 5K in Anaheim, CA. “It was really exciting to cross that finish line. To know I started in one place and ended in another place really made the extra walks and training worth it,” says Julie who raised an additional $1,000 through Team Momentum that will be credited back to her branch. Julie keeps her family’s legacy of service close to her heart. 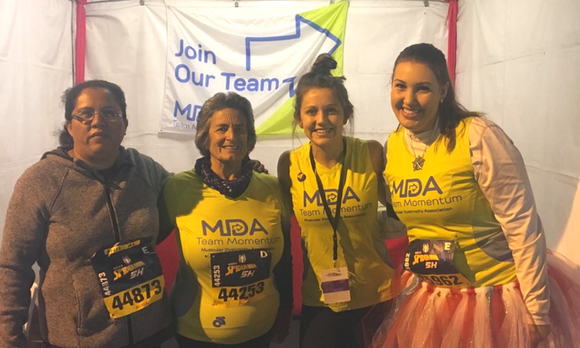 MDA Team Momentum is now accepting 2018 registrations for walkers and runners to participate in 5Ks, half or full marathons. Find out how you can cross the most meaningful finish line of your life by visiting mdateam.org.